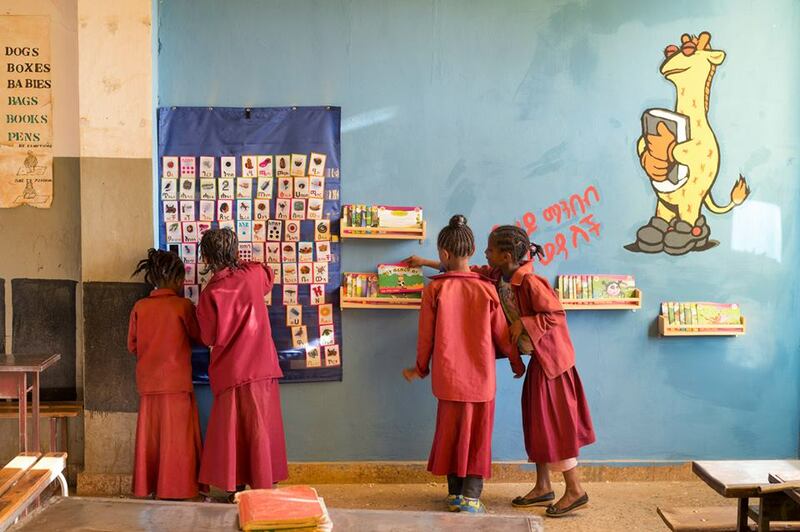 Find out how your school can benefit from Tsehai’s awesome reading materials. Studies have shown that fluency in a second language is nearly hopeless without full literacy in the learner’s first language – the language children speak at home with their families. One of the challenges of teaching Amharic in Ethiopian schools has always been a lack of reading materials for young readers. Without books in Amharic, the young student does not have a clear motivation to read or the rewards and feeling of accomplishment one gets from completing a book. A lack of materials in the mother tongue creates an impression that your own voice is not valuable. To solve this problem, Whiz Kids has developed a Classroom Library Kit containing fun storybooks and other materials designed to make learning how to read easy and fun. Invite Tsehai to Your School Today! By ordering the minimum school package of four complete reading corner sets (see above), you will equip at least four classrooms with a reading corner for less than 10,000 ETB.